Curious chalk inscriptions on the walls of an ancient stone quarry in Surrey are being systematically recorded for the first time as part of a wider research project to better understand the long and hitherto hidden history of this important source of stone for London. Peter Burgess reports on how the chalk inscriptions have been identified as ritual protection marks. Members of the Wealden Cave and Mine Society (WCMS) have started a project to record chalk and other inscriptions within the old quarries. Initially, visits are to a particular area where the symbols have been noticed previously as long ago as 2006, and where there is some evidence of stone extraction during the period from about 1500 to the early 17th century. 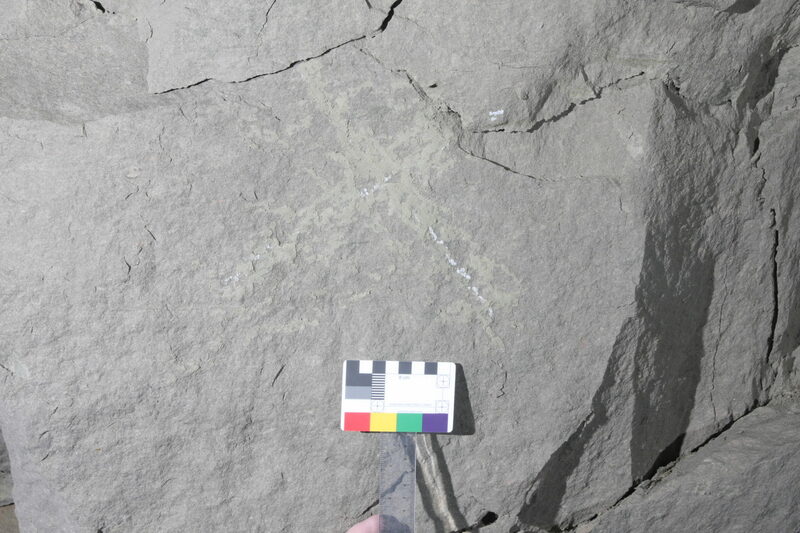 Once this has been recorded, other parts of the quarry system will be studied for similar markings. Many miles of subterranean quarry workings lie at the foot of the downs in east Surrey. Much of these are so old that no records exist of when the galleries were excavated, or who the quarrymen were that worked in the dark with only a guttering candle for illumination. Those men used picks, hammers and wedges to painstakingly remove countless blocks of the light, greenish-coloured sandstone and transport them out to daylight on sleds drawn by oxen and ponies. Much of the stone was destined to be used in the construction of a number of prestigious buildings along the Thames from Windsor Castle in the west, as far as Canterbury Cathedral in the east, along with many London structures such as Westminster Palace and Abbey, and the Tower of London. 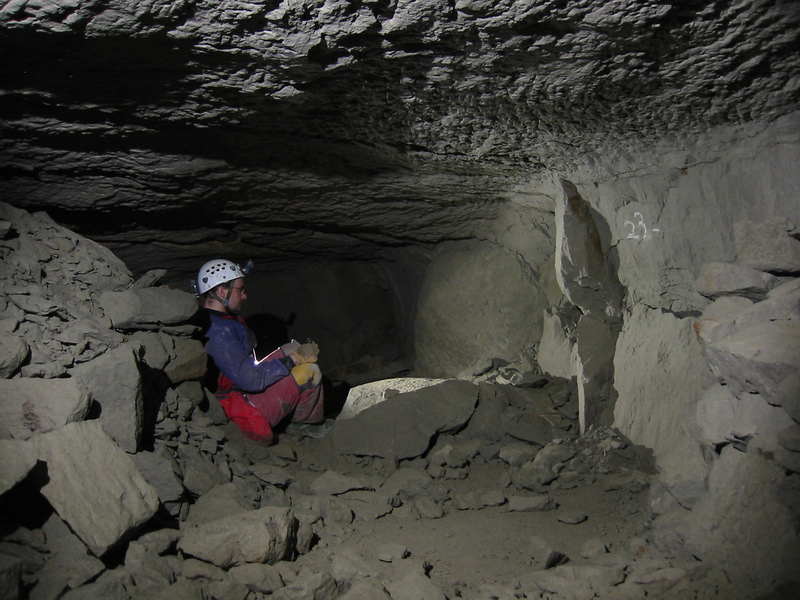 Increasingly over recent years, it has become apparent just how much evidence remains in the extensive labyrinthine quarry system to demonstrate how the stone was extracted. Later workings in the area have a profusion of inscription on the walls written by quarrymen, casual visitors and those who later worked in the abandoned passages growing mushrooms. But the quarries near Chaldon were never used for any other purpose once the valuable building stone had been worked out, and they were quickly lost and forgotten. With the exception of one area where clear dating evidence remains, such as chalked dates and names, and tobacco claypipes from the early 18th century, there is almost nothing in much of the quarry to demonstrate when it was actively worked. It is likely that extraction was spread over several centuries, and the complete lack of clay pipes is unlikely to be due to the abstinence of the quarrymen, and far more likely to be because it pre-dates the popular use of tobacco from the early 17th century onwards. The size of the ancient quarries near Chaldon is impressive. Approximately 17,000 metres of quarry passage have been recorded, and that is just those that are still accessible. As much again probably exists, sealed off forever by falls of ground, or filled with waste rock as part of the quarrying process. In the last 50 years, research and exploration of the workings have resulted in the production of a plan survey, and the recording of numerous artefacts, mainly iron objects such as extraction wedges and the shoes from haulage animals, namely oxen and ponies. What inscriptions do exist were largely overlooked, having no obvious interpretation, and many have even been mistaken for modern route-finding marks, and targeted in graffiti removal operations by cavers with the best of intentions! Things started to change after the publication of a paper describing some curious symbols carved into stalagmite in Goatchurch Cavern, a frequently visited Somerset cave. The discovery of several demonstrably old inscriptions resembling the letter W started a wider awareness of ritual protection marks in caves. 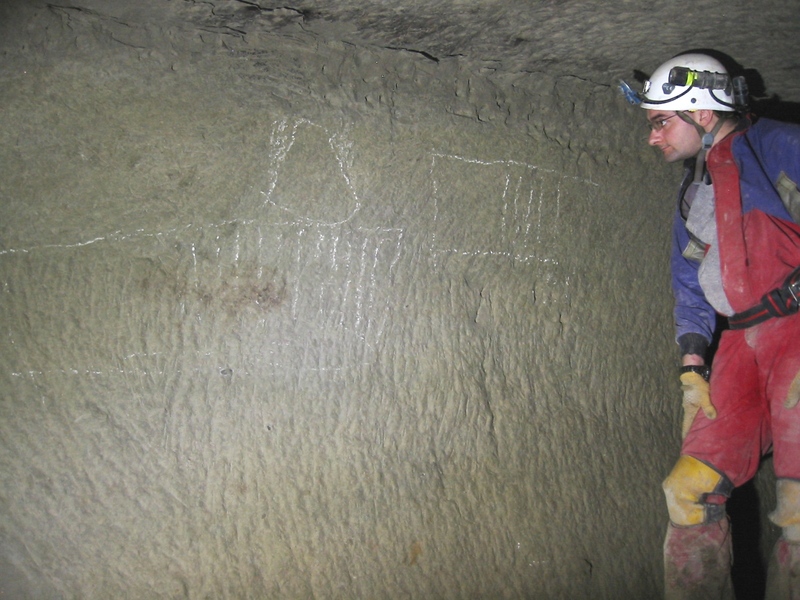 The publication of this discovery by the University of Bristol Speleological Society (UBSS) in 2004 was followed by a second in 2010 which described further work at Wookey Hole and Long Hole, where many more similar marks were recorded, and it is now established that there was once a common use of such symbols in underground locations, and not just in dwellings and other buildings. WCMS’ first recording session was completed on November 24, 2018, with the methodical recording of about 40 inscriptions. It is likely that several more visits will be required in the coming months before any firm conclusions can be made about the extent and the significance of the ritual protection marks in this location. 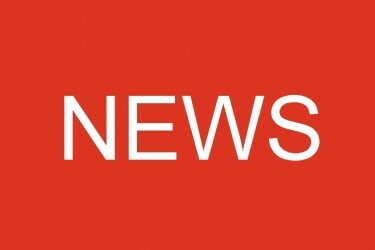 Nevertheless, enough has been recorded to make a few initial observations and comment on the pattern of marks found to date. A significant number of the marks found so far have been subject to deliberate removal attempts by well-meaning cavers targeting spray-painted route markers and similar graffiti. Unfortunately, a number of the chalk marks were wrongly identified as modern waymarks. 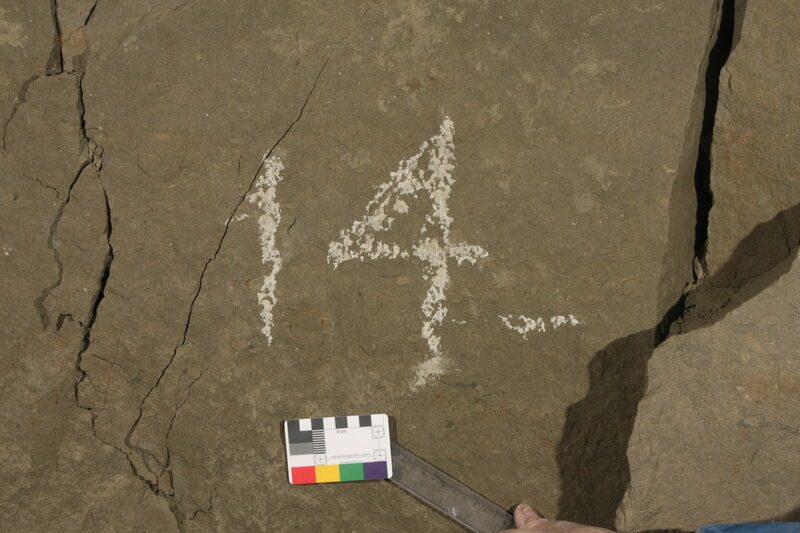 Nevertheless, chalk is surprisingly difficult to remove from the abrasive rock surface, and enough remains of the original marks to identify what was once written there. 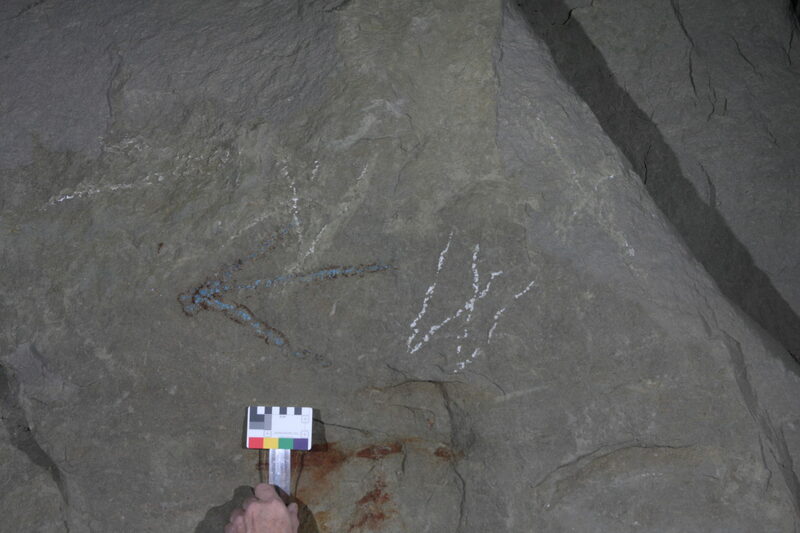 WCMS members are also recording other chalk markings – what are being described as “functional” inscriptions. 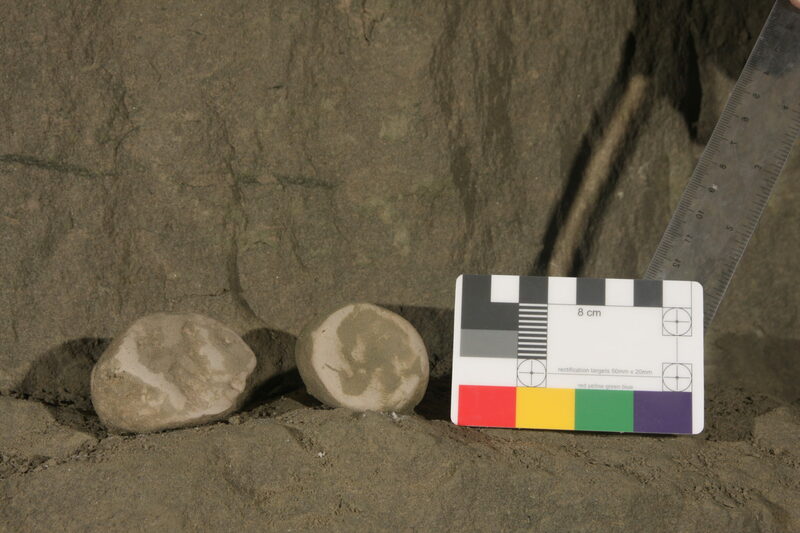 These are the chalk marks made by the quarrymen to facilitate their work, such as tally marks, and lines to mark up the quarry face before blocks were extracted. Members also located two well-worn lumps of chalk almost certainly used by the quarrymen to mark the walls. There are some marks that may simply be the result of someone using the wall to sharpen an edge onto the chalk lump to make it better suited for writing with. It is not only the walls that are being inspected for chalk marks. The roof of the quarry, which is rarely more than 1.6 metres high, bears the soot marks from candles that were most likely made of tallow, and apart from the soot left where a candle was left to illuminate the gallery, there are also some carefully drawn shapes and letters. Some of these resemble ritual protection marks. Each inscription, or set of inscriptions where there are several close together, are being photographed with a scale-card, given a reference number, and its location is marked onto a plan survey. Any relevant context is recorded. 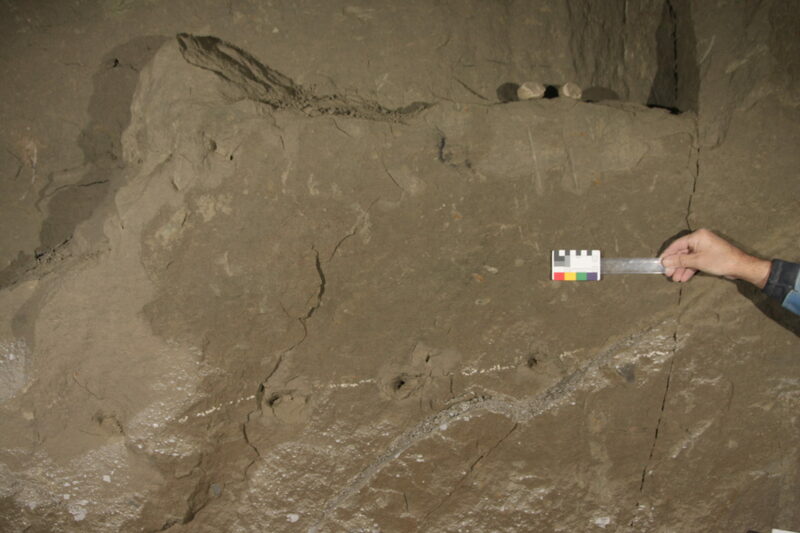 For example, if an inscription is partly obscured by a pile of quarry waste, this demonstrates that the waste was piled against the rock face after the chalk mark was made, which reveals that the ritual protection mark will have been drawn while the quarry was being actively worked and not at a time after extraction ceased. Of the possible ritual protection marks recorded on the first visit, V, W, M are the most common, with two R symbols, drawn very similarly. In addition there are several X marks, the significance of which has not yet been identified. The W and M marks are believed to represent marks invoking the protection of the Virgin Mary. 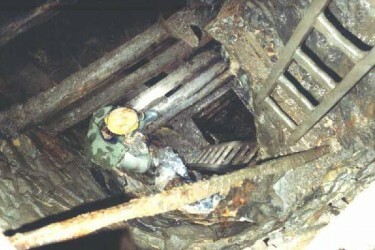 Of the functional marks recorded, tally marks and numbers drawn to identify extraction galleries are the most obvious. The numbers are themselves of interest, being Arabic numerals, and believed to date from the 16th century on account of the numbering style. One of these numbers (13) is accompanied by the same number using a Roman numeral (XIII). Preliminary analysis of the locations of the ritual protection marks suggest that they were protecting portals between adjacent galleries. The quarry was developed throughout using the pillar and stall extraction method. In essence, this results in parallel extraction galleries (stalls), with regular eyes between them, allowing access from one to the next, and which were sometimes used to develop haulage routes to the nearest convenient entrance. The most commonly used locations for the ritual protection marks recorded on our first visit are on the rock pillar either side of the eyes between stalls. One interpretation of this pattern would be that the quarrymen were protecting themselves in their day-to-day work location, and as the working area extended, they made additional protection marks as they moved into new extraction galleries. 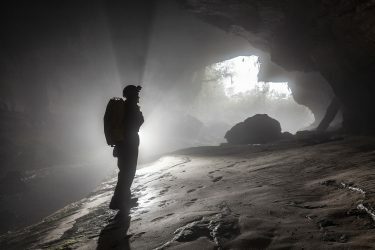 In this respect, the ritual protection marks were used to provide safety within an area, much as they were used in domestic buildings, unlike the marks found in the Somerset caves, where it is thought that the supernatural spirits, having been banished to the cave, were prevented from leaving the underground environment by trapping them beyond the protection marks. The original quarry entrances can no longer be inspected as they are largely collapsed and buried by surface soil and rock. The modern entrance has been excavated vertically through this material, and it is not possible to see the original portal at this or any other former entrance. It would not be surprising to learn that the quarrymen also protected the entrances to the underground workings in the same way. Since the workings were developed over several centuries, only a small part of the system would have been familiar to the quarrymen of any particular period. It would have been the most natural thing to mark the walls within the quarry as well as at the entrance, as openings to areas complete unknown to the men were manifold throughout the system. The project came about following a talk at Hidden Earth by Linda Wilson on the subject of ritual protection marks in Somerset caves. Helen Dear, one of the team, has been interested in the subject for some time. “I first became interested in the chalk marks in Chaldon Quarries about eight years ago after discovering many ‘witch marks’, labyrinths, and a list of names written in beautiful handwriting that puts most peoples script to shame these days,” says Helen. Future visits will extend the area studied to date, and may shed further light on the extent of the ritual protection and other marks and provide a better understanding of why and how they were used.